KNOCKOUT ARTIST Ryan “The Fire Fist” Lumacad of General Santos City knocked out feisty Juan “Punisher” Purisima in the second round to capture the vacant Philippine Boxing Federation (PBF) bantamweight title Sunday night in Mandaluyong City Sports Center. The 24-year old Lumacad landed a solid body punch to score his 7th knockout win in 11 victories with no loss and two draws. Lumacad received a golden belt donated and awarded by Thailand boxing patron Naris Singwangcha, who also gave a cash bonus to the new champion. 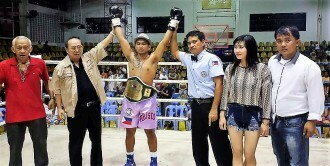 Purisima, a former PBF flyweight champion dropped his record to 11 wins, 10 losses and 1 draw. Lumacad previously fought against Ardin Diale for the interim OPBF super flyweight title held Sept. 30 at the Strike Coliseum in Bacoor, Cavite. The fight, however, ended up in a controversial technical draw after Diale decided not to continue fighting due to a nasty cut on his eyebrow. Lumacad used to fight under the MP Davao Stable and Sonshine Boxing Promotions in Davao City before joining the Highland Boxing Promotions in La Trinidad, Benguet. The Lumacad-Purisima championship fight top billed the “Tagisan ng Lakas” promoted by the Highland Boxing Promotions of international boxing promoter-manager Brico Santig. Photo: Naris Singwangcha (2nd from left) raising the hands of newly-crowned PBF bantamweight champion Ryan "The Fire Fist" Lumacad. At extreme right is promoter Brico Santig of Highland Boxing Promotions.